After tasting this Amarula And Mushroom Ice Cream over and over again, I cannot help but think what an amazing stand alone dessert it will make. I can imagine this ice cold dessert being served alongside a strong, hot espresso for afternoon tea after spending the day in the bushveld. I would not say no to it after a meal enjoyed with friends around a camp fire either. This recipe forms part of the Celebrate Amarula As Part Of South African’s Heritage competition and is my first entry. The participants of this competition have been tasked to create a dish using Amarula, and the prize is a luxury getaway in the Bushveld. 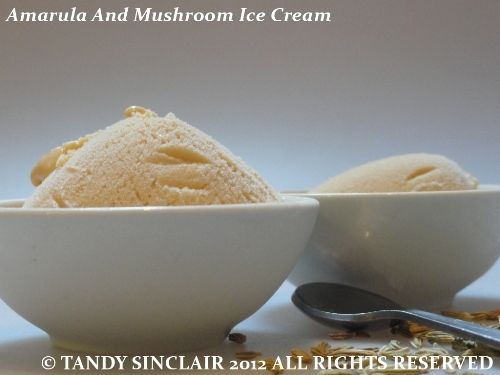 To this end, I was provided with a bottle of Amarula and it started my thought process and the first recipe I came up with is this amazing ice cream. The ice cream is easy to make and you will need two lots of overnight’s to get it to a frozen state. Ice cream with alcohol does not freeze solidly which means you do not need to take it out of the freezer before serving. It’s been so hot here lately, that it sounds like just the answer as I love ice cream and Amarula. Wow, Tandy, what a brilliant recipe!!! Oh m’gosh this sounds AMAZING!! Winning recipe!! Mushrooms? In ice cream? Really? And yet, I now have implicit faith in your recipes. I love making ice cream, and I can grab some really rich cream and milk while we’re in Cornwall. Thanks, Tandy! Amazingly weird and weirdly amazing. Would love to try this! Now this is not a combination I would have thought of – very original Tandy! Beautifully photographed! Wow! What a combination! Very creative. Love Amarula but I confess I’m not sure about the mushroom flavour! Would love to taste it. Nice photo Tandy. I remember having a dessert in Kruger years ago which was amarula in the middle of fried icecream – so decadent and so delicious! Interesting flavours, although I have not heard of Amarula. Ice creams with alcohol are always a good idea.